Forum Index > Makers and Manufacturers Talk > "Espee d'Armes"
Posted: Wed 01 Oct, 2014 7:51 am Post subject: "Espee d'Armes"
I finished this one a while ago, in late July, and only recently got the pics from its owner. 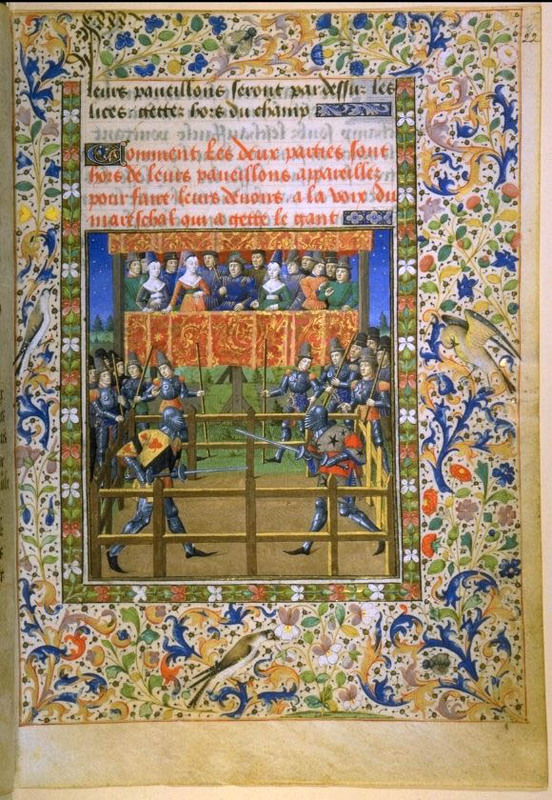 The blade is inspired by the so-called "Solothruner Fechtbuch", and the guards shape and consturction was deduced from French ms. 2258 of the Bibliothèque Nationale de France, who shows it on two colourful plates. Basically, the front roundel is inserted from the point end, while the matching cross guard is inserted on the tang side, the two being riveted together to give a sturdy fit - the other guard is of regular crossguard-plus-shell construction. The inside of each plate has been fire-blackened to protect from rust. The blade is spring steel, slightly hollow-ground and with a strong diamond point. (his kit isn't complete, so don't look too hard - and to the right, with the point dangerously close to his eye is Dr Daniel Jaquet - that name might ring a bell to some of you). I can't give you the final dimensions however, but if you leave me some time I'll manage to get them. ...and handle is veg-tanned, iron oxyde dyed leather over cord over wooden core. Forgot to mention. This might be the coolest thing I've seen made in quite a long time. I am not sure I've seen one recreated before. I'd love to see a video posted of it being used. 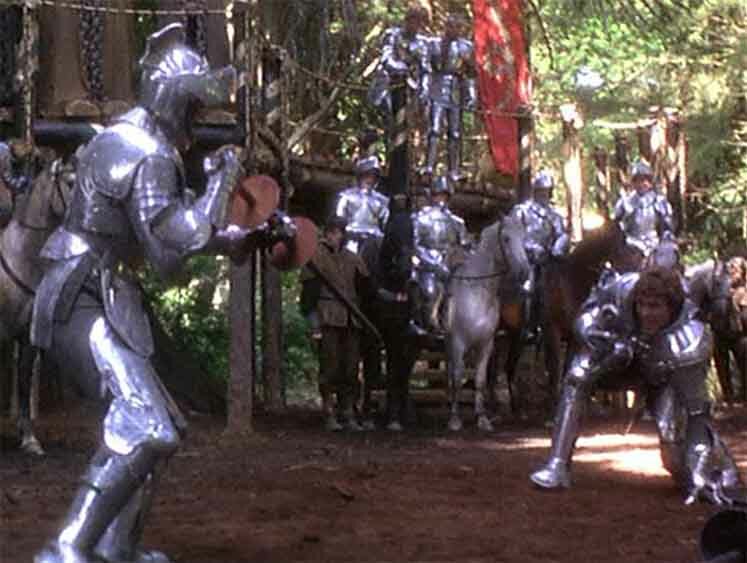 There was one used by Liam Neeson in "Excalibur," for what it's worth. Not nearly as nice as Fabrice's! The reinforced section at the point and below can't be sharpened can it? Its almost a triangle. Wow. I haven't seen that movie in so many years and certainly not with as much knowledge as I have now (which isn't much)... so thank you for that screen grab. Really interesting! Sharp? Dammit, Fabrice... now I want it even more. Gee thanks. Very interesting piece - excellent work! What is the pommel made out of? I'm assuming it's cast? Aaron : Pommel is steel, hand forged and filed to shape. Hector : the point is of strong diamond section, but the edges are rather sharp. Odd, Weird and very well executed. I too would love to see this sword?, thing? in action as it really is very curious. Well done on getting such an unusual commission and making it so convincingly. Any word of praise from you is more than needed. And remember I failed to deliver in time. But it was quite a worthy project. Next will be better.